As of this writing, I did not finish tracking my push to Silverdale. I have completed the journey, but I went to Benton a few weeks ago (end of May,-June) and while on the road, I stopped. 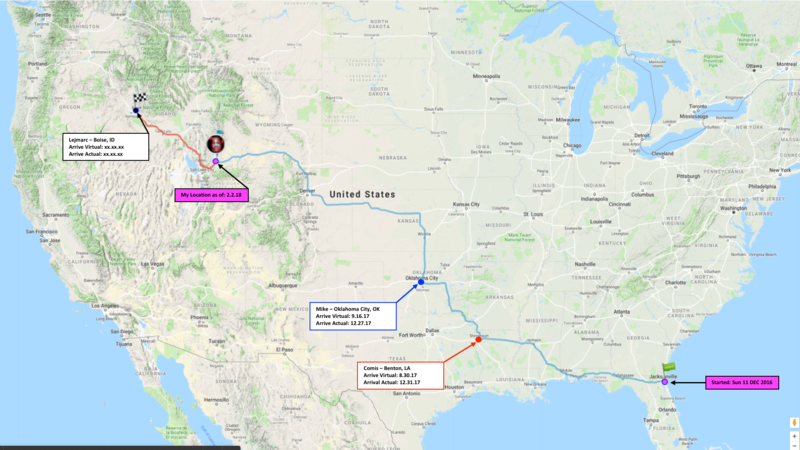 It is now the 1st of July and while I have added an additional 200+ miles, I have not added any to the online tracker. Actually, that is not true, you can see my tracker in the table below. It is the most current mileage and I update it daily. I have a summer blast working with Chey and I have pulled her in to DareBee for this month. Hopefully she sticks with it. – Summary: Transition to Combat HIIT; got very little work done – will change that. – DareBee Exercise (Day 31-1): “Combat HIIT – Practice“ – Lots of kicks. Love the transition – Check! – Daily Dare (369): “30 Circle Crunches” – Don’t think I was ready for this so early after getting up – Check!. – Baseline: No problems with getting through this; no issues with left shoulder today – Check!. – Distance: Added 6.80 mi to my total on my way to Bangor, WA. Rest: I will get 6.5 hours of sleep each night! Ciao! – Daily Dare (370): “2 Min. High Knees” – I love these. I think I will do them everyday for the RoML – Check!. – DareBee Exercise (Day 30): “APB – Combat“ – Relatively easy. Lots of kicks and squats – Check! – Daily Dare (368): “20 Raised Leg Push Ups“ – Not an issue at all; I love these – Check!. – Baseline: No issues. Left shoulder was pretty much a non-factor today – Check!. – Summary: Relatively good day. Nothing much to talk about. Listen to Sam’s podcast, provocative no less. – DareBee Exercise (Day 29): “APB – Cardio“ – I liked this. Moving into my final day and feeling great. – Check! – Daily Dare (367): “40 Raised Leg Circles” – I loved these – just enough of a challenge to keep it going – Check!. – Baseline: With my shoulder taped, I am on top of the world – Check!. – Distance: Added 7.00 mi to my total on my way to Bangor, WA. Rest: I will get 6.5 hours of sleep each night! Ciao! – Summary: Wonderful day. Lots of talking and working through karma. Pretty healthy stuff in some ways. – DareBee Exercise (Day 28): “APB – Lower Body“ – Not too bad. Love the workout – Check! – Daily Dare (366): “20 Jump Squats” – Squats are such great exercises. They burn, but they get it done! – Check!. – Baseline: No issues, just do the normal push and got it done – Check!. – Summary: Pretty good day. I feel like i am on track today. Finished with workout and it is 1811 now. – DareBee Exercise (Day 27): “APB – Upper Body“ – Relatively simple workout – Check! – Daily Dare (365): “2 Min Elbow Clicks” – Pretty easy. Having shoulder issues -need to address – Check!. – Baseline: No issues – just worked it through. Not too back on the shoulder – Check!. – Summary: Today was a freaking sluggish day. My right eye is kinda bothering me a bit. I have to watch it. – DareBee Exercise (Day 26): “APB – Lower Body“ – No worries. Hit the abs out of the park – not really – Check! – Daily Dare (365): “20 Shrimp Squats” – Not an easy exercise, if you go for the deep squats – Check!. – Baseline: Felt sluggish so it was not that easy today – Check!. – Summary: It is 1324 and I am finished with my workout for the day. Waiting to hear from Marty on mama. – DareBee Exercise (Day 25): “APB – Lower Body“ – This was slightly challenging; got a little burn – Check! – Daily Dare (364): “40 Situp Punches” – Oh yeah! Got some of the situps knocked out – Check!. – Baseline: Felt pretty good. Not much issue with the left hand. Will get it wrapped today – Check!. – Distance: Added 8.20 mi to my total on my way to Bangor, WA. Rest: I will get 6.5 hours of sleep each night! Ciao! – Summary: Got through workout relatively early without issue. Feel a bit down about mama stuff hanging. – DareBee Exercise (Day 24): “APB – Cardio“ – Wow! This was tough; only managed level 2 and I was gassed – Check! – Daily Dare (363): “40 Situp Punches” – Oh yeah! Got some of the situps knocked out – Check!. – Baseline: The left shoulder was giving a bit of prob today. I have to have to taped – Check!. – Distance: Added 7.20 mi to my total on my way to Bangor, WA. Rest: I will get 6.5 hours of sleep each night! Ciao! – Summary: Not a bad day. Felt a bit tired – but I did not get a proper respite. – DareBee Exercise (Day 23): “APB – Yoga“ – This has always been challenging got to work at it – Check! – Daily Dare (362): “5 Min Raised Arms Hold” – That was quite challenging – Check! – Baseline: Felt a bit tired today; nothing in particular was aching. – Check!. – Distance: Added 6.90 mi to my total on my way to Bangor, WA. Rest: I will get 6.5 hours of sleep each night! Ciao! – Summary: Pretty good day. Too a bit longer than intended but now sweat. – DareBee Exercise (Day 22): “APB – UpperBody“ – Pretty easy day. Knock this out early – Check! – Daily Dare (361): “20 Hop Heel Clicks” – Not challenging at all – Check!. – Baseline: Not an issue at all. Broke it up and knocked it out – Check!. – Distance: Added 9.10 mi to my total on my way to Bangor, WA. Rest: I will get 6.5 hours of sleep each night! Ciao! – Summary: Not a bad day generally. Working on finish up work with Chey and doing my workout. – DareBee Exercise (Day 21): “APB – Combat“ – Pretty good workout; challenging enough – Check! – Daily Dare (360): “40 Plank Rotation“ – A bit challenging. Loss the plank for a micro second; loss balance – Check!. – Baseline: No issues, just pushed through without issues – Check!. – Distance: Added 7.30 mi to my total on my way to Bangor, WA. Rest: I will get 6.5 hours of sleep each night! Ciao! – Summary: Oh yeah. Finished up my workout pretty early today. Around midday. – DareBee Exercise (Day 20): “APB – Abs“ – Easy day, nothing to it – Check! – Daily Dare (359): “40 Plank Jacks“ – Pretty easy. Two of my favorite exercises combined – Check!. – Baseline: Just push through in bits and pieces without issue – Check!. – Distance: Added 7.90 mi to my total on my way to Bangor, WA. Rest: I will get 6.5 hours of sleep each night! Ciao! – Summary: Not a bad day, just dreary, feeling kind of down. I am gonna us the mind-state change. – DareBee Exercise (Day 19): “APB – Tendon Strength“ – Pretty good workout. Last one was weak – Check! – Daily Dare (358): “20 Downward Upward Dogs“ – Pretty easy dare today. Strong legs – Check!. – Baseline: Easy day. Just push through without much effort really – Check!. – Distance: Added 6.60 mi to my total on my way to Bangor, WA. Rest: I will get 6.5 hours of sleep each night! Ciao! – Summary: Pretty enjoyable day today working out with Cheyenne. Will have to do more of that. – DareBee Exercise (Day 18): “APB – Lower Body“ – Had this done, but WP is miffing me off – Check! – Daily Dare (357): “50 Calf Raises“ – Pretty easy dare today. Strong legs – Check!. – Baseline: Press through without issue – Check!. – DareBee Exercise (Day 17): “APB – Lower Body“ – Had this done, but WP is miffing me off – Check! – Daily Dare (356): “3 Min. Punches“ – Today was whole heap of punches; it was crazy – Check!.. – Baseline: Had no issues getting this done, no creaks or wreaks – Check!. – Summary: Pretty ok day. No issues, just plugged away at my workout and moved on. – DareBee Exercise (Day 16): “APB – Upper Body“ – Pretty enjoyable workout. Not too stressful – Check! – Daily Dare (355): “40 Bridge Taps” – Pretty easy. I pretty much do these every day – Check!. – Baseline: No issues’ while, I did hear a few creaks I did not feel any pains in the left shoulder. – Check!. – Distance: Added 7.10 mi to my total on my way to Bangor, WA. Rest: I will get 6.5 hours of sleep each night! Ciao! – Summary: Weird day. Did not get enough sleep as it was and then I could not get started with Chey. Will do betta! – DareBee Exercise (Day 15): “APB – Yoga“ – Historically been challenging, but I will master; was ok – Check! – Daily Dare (354): “30 Air Circles” – Not easy at all. I had to do it a couple time to get it done properly – Check!. – Baseline: A bit tired but I pulled it out – Check!. – Summary: Pretty ok day. Not much to say beyond, I didn’t finish until pretty late. Worked a bit with Chey too. – DareBee Exercise (Day 14): “APB – Combat“ – Relatively challenging day. Lots of squats, but not that bad- Check! – Daily Dare (353): “40 Heel Taps” – Another pretty easy day. I love core exercises – Check!. – Baseline: Pretty straightforward. Felt a bit of ache in my shoulder this morning, but I think it is going away – Check!. – DareBee Exercise (Day 13): “APB – Cardio“ – Pretty good workout today, workout all the muscle groups – Check! – Baseline: No issues today, got it done pretty quickly – no issues with left shoulder – Check!. – DareBee Exercise (Day 12): “APB – Abs“ – Not too bad, lot so planking moves – Check! – Daily Dare (351): “60 Bicep Extensions“ – Pretty easy, not much of a dare, just got a very slight burn – Check!. – Baseline: Not too much of an issue. The left should was a bit twerky, but I am ok – Check!. – Distance: Added 6.30 mi to my total on my way to Bangor, WA. Rest: I will get 6.5 hours of sleep each night! Ciao! – DareBee Exercise (Day 11): “APB – LowerBody“ – Lots of squats movement, not that bad – Check! – Daily Dare (350): “30 Windshield Wipers“ – No issues. A bit rough on the left should but it’s ok – Check!.. – Baseline: No issues. Did not feel much on the left shoulder – Check!. – DareBee Exercise (Day 10): “APB – UpperBody“ – Lots of punches and shoulder taps – Check! – Daily Dare (349): “2min Tree Pose“ – No issues. A bit rough on the left should but it’s ok –Check!. – Baseline: No issues here, just knocked them out – Check!. – Summary: Not a bad workout. Got through is relatively easy. Just an overall good day. – DareBee Exercise (Day 9): “APB – Cardio“ – Not too bad. Not much cardio though, although good burpees – Ck! – Daily Dare (348): “2min Jumping Jacks” – Helped with the dailies – Check!. – Baseline: The easy stretch is going. I feel as though my pushup has crossed a threshold; easy 50 is coming- Ck!. – DareBee Exercise (Day 8): “APB – UpperBody“ – Relatively easy day; just most punches to do – Check! – Daily Dare (347): “2min Jumping Jacks” – Easy day; helped with my dailies – Check!. – Baseline: Felt a bit easy today – did 40s on the PU’s and did not have any ill-effects – Check!. – DareBee Exercise (Day 7): “APB – UpperBody“ – Relatively easy day; just most punches to do – Check! – Daily Dare (346): “80 Knee to Elbow Crunches” – Doubled up on this one – Awesome stuff! – Check!. – Distance: Added 6.70 mi to my total on my way to Bangor, WA. Rest: I will get 6.5 hours of sleep each night! Ciao! – Summary: Another weird day. I was able to catch up and complete all my readings. I think I like that approach. – DareBee Exercise (Day 6): “APB – Yoga“ – Gonna be intense. I will meet it head on tho, It was good – Check! – Daily Dare (345): “40 Squat Hold Side Bends” – Nice movement. It works core and squats, it is awesome – Check!. – Baseline: Not too bad. Got through it late, even though I got started pretty early Check!. – Distance: Added 8.50 mi to my total on my way to Bangor, WA. Rest: I will get 6.5 hours of sleep each night! Ciao! – DareBee Exercise (Day 5): “APB – Cardio“ – I barely got much cardio out of this to be honest – Check! – Daily Dare (344): “40 Swallows” – This was not at all an easy exercise. Took lots of patients – Check!. – Baseline: No issues at all just push through – Check!. – Summary: Very simple exercise day; I will most like do it again. Just need to finish up my baseline and cardio. – DareBee Exercise (Day 4): “APB – Abs“ – Nothing to it, just did some a few planking moves – Check! – Daily Dare (343): “50 Knee-to-Elbow Twists” – Pretty straight-forward and easy – Check!. – Baseline: No issues, still getting used to the jump to 120, but all it good. – Check!. – Distance: Added 8.70 mi to my total on my way to Bangor, WA. Rest: I will get 6.5 hours of sleep each night! Ciao! – Summary: Not so bad right now. I have completed my APB and it is not even 0730 yet. Pretty simple. – DareBee Exercise (Day 3): “APB – Lower Body“ – Ok workout – pretty heavy on the legs (thighs) – Check! – Daily Dare (342): “60 Shoulder Taps“ – Not that bad. This will help out my planks too – Check!. – Baseline: Took me until 1857 to get done. No issue though, just pressing – Check!. – Summary: Another good day again. Just chillin’ with the wife and daughter. Son is doing his thing – lovin’ it. – DareBee Exercise (Day 2): “APB – Upper Body“ – Not a bad workout. I like the single arm side stand – Check! – Daily Dare (341): “60 Balanced Swings“ – The balance is a bit challenging, but it is ok – Check!. – Baseline: These felt a bit better today so I just pushed through and got it done without issue – Check!. 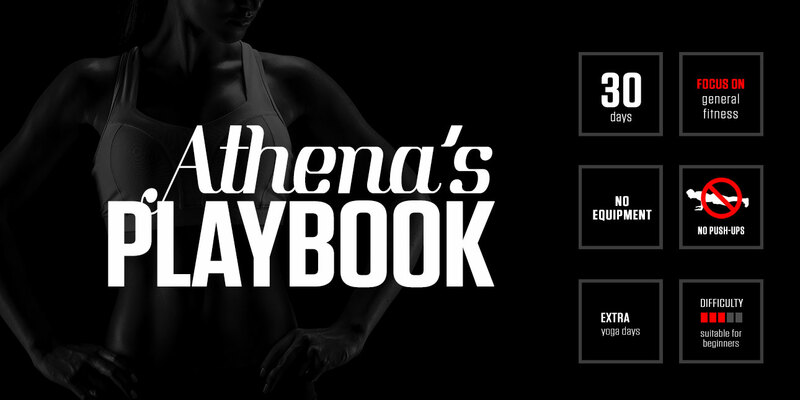 – Summary: Relatively good first day of Athena’s Playbook. It is not an easy workout by any stretch. – DareBee Exercise (Day 1): “APB – Cardio“ – Lot of JJ, HK and Burpees – love it! – Check! – Daily Dare (340): “40 Situps” – Pretty matter of fact, these are a part of my daily – Check!. – Baseline: Just upped it to 120s, somehow it feels like I went up by 50. No prob, just need to get used to it – Check!.